Sony STR-DN1050 review | What Hi-Fi? We can’t say we didn’t have high expectations of the STR-DN1050. As the successor to the Award-winning STR-DN1040 and the big brother to the five-star STR-DN850, all eyes are on it to impress. No pressure, then. Fortunately, Sony knows a thing or two about what makes a great AV amp at this price, and the STR-DN1050 is quite the audience pleaser. From set-up to performance, this 7.2-channel amp with 165W per channel (into 6 Ohms) has been carefully considered at every single step, and it shows. Like its smaller sibling, the 1050’s interface has been designed to make things as simple for the user as possible. It pipes up with its Easy Setup menu, prompting you to run the auto calibration and set up your network connection as soon as you switch the amp on for the first time. The auto calibration experience is a swift and pleasant one, and surprises us with its accuracy – we tweaked a few results but largely they tallied with those from much lengthier, more in-depth set-ups. The menu system on the amp is equally enjoyable, offering bold, easy-to-navigate menus, and we have to give Sony credit for the pared down remote too – it’s refreshing to see an amp remote that doesn’t require its own manual to explain which button does what. When it comes to performance, Sony has certainly not rested on its laurels either. There’s been a lot of internal tweaking gone into trying to push the sound quality of the '1050 past that of the STR-DN1040, including an improved power amp circuit and jitter-reducing tech borrowed from the company’s pricier ES range. We put all this to the test with Fast and Furious 6, and are greeted with a familiar character to last year – the 1050 is a big-sounding, muscular amp that immediately makes you sit up and pay attention. Its low-end is neighbour-botheringly weighty, giving real grunt to a bevvy of revving car engines, all while remaining full of detail and agility. This is nicely balanced out by an articulate, spacious midrange and clear treble that all come together to produce a truly cohesive sound in a wide soundfield. Add in expert handling on dynamics and pin-sharp precision and the result is a thoroughly engaging and exciting listen, even at lower volumes. If you want to blow away some cobwebs though, this amp can take it. Nudge the volume up and it becomes more impressive still, enveloping you in a sound that is bigger, fuller and dynamically richer. You might notice the occasional touch of brightness in the treble at these levels, but nothing that becomes annoying or tiring – this amp is endlessly listenable. Just as it performs with the blockbuster content, so it does with dialogue and more subtle sound effects, proving itself to be one of the most detailed amps we’ve tested at this price. Voices are crisp and textured, clarity is second to none and sound placement is spot on, putting you at the centre of the action in a very natural but impactful way. It’s a lot of what we loved in the 1040, but bigger and more refined, particularly when it comes to detail and clarity across the frequency range. It’s these subtle tweaks across the board that all add up to an impressive performance indeed. Feature additions are more obvious, and you can now count on aptX Bluetooth being on board, DSD playback via wi-fi and USB (previously only via HDMI) and NFC for one-touch pairing with compatible devices. There’s also an extra MHL (mobile high-definition link) connection, so you can use one for big-screening video and apps from mobile devices, while keeping the other free for a Chromecast, for example. Inputs are largely the same as last year, with six HDMI inputs with 4K upscaling and 3D/4K passthrough, and three out. There are also four sets of inputs for analogue audio, three for composite video, one coaxial and two optical – though how long we’ll see these on receivers at this price is up for debate. One of the HDMI outs goes towards the 1050’s fairly extensive second-zone features, outputting any HDMI source independently from the main zone as well as offering active and passive zone outs for network and USB audio (which supports up to 24-bit/192KHz) and Bluetooth. Alongside Bluetooth, DLNA and AirPlay capabilities, you’ll find Spotify Connect functionality, which is new this year, as well as a number of music services built into the amp, including TuneIn Radio, Deezer and Sony Music Unlimited. The latter three are available and browsable via the on-screen Music menu (or via Sony’s companion app, Songpal), while Spotify is used directly via its own app on your smartphone or tablet, as with all Connect-compatible kit. Once connected, the amp talks direct to Spotify itself, and not your phone or tablet, with the amp remote capable of controlling your currently playing playlist. You’ll need to use the Spotify app for browsing and the like, but the Connect functionality does mean you’ll get the full Spotify experience, including access to generated playlists and radio stations. The only thing the Sony doesn't have – unlike the identically priced Onkyo TX-NR636 – is Dolby Atmos capability, which the Onkyo will get as a firmware upgrade in September. No matter which way you choose to listen to music, we found all methods to be quick to connect and easy to use. Like the 850, the 1050 has a real charm with music, holding together well in stereo for a rhythmic, musical performance. Switch up to a CD and it’s a fuller and richer sound, with improved precision and dynamics over streamed content. There’s certainly less of a bright edge here than we found in the 850, with the weightier character of the 1050 able to resonate into its stereo performance too without overpowering the overall balance and timing. The Songpal app is new this year and a worthwhile download. You are able to connect via Bluetooth for controlling music services, but connect via wi-fi (which you can actually set up via the app if you skipped it in the Easy Setup) and you’ll have the ability to change sources and tweak EQ settings for each one. It’s not as in depth as some control apps, like those from Yamaha or Pioneer, but it is easy to use and delivers the functionality that most people will need. Following the success of the STR-DN1040 was never going to be an easy task, but Sony has undoubtedly managed it, packing in features to the 1050 that we missed last year and refining an already-excellent performance to make it even better. 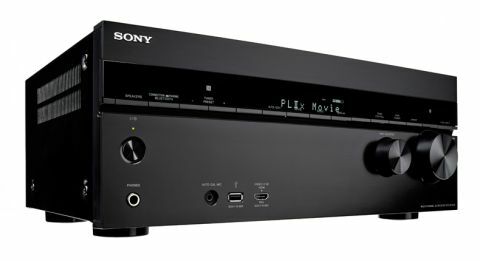 Sony has raised the bar once again for the competitive £500 AV receiver market – how high can the competition jump?